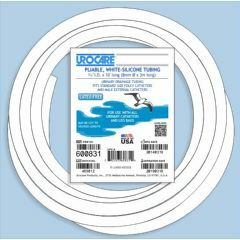 Clear- Vinyl Drainage Tubing - 60"
Drainage and extension tubing is used to connect male external or Foley indwelling catheters to bedside urinary drainage bags, night drain bottles or other urinary appliances. Provides a snug fit on most standard sized connectors, adaptors and fittings while resisting kinks. May be cut to desired length. As you promised, the wheelchair just arrived, it looks great!!! I would like to thank you for all your help in making this possible, without you dedication and understanding our family vacation would have been spoiled, again many many thanks. Allegro Medical has delivered again.